When Etsy set us the challenge to curate a beautiful gallery wall using affordable Australian art, we jumped at the opportunity. We love supporting local creatives, and we’ve both got a solid appreciation for original art work – from prints to painted originals. Most of all, we wanted to show you how easy it is to start an excellent art collection on a budget (the cheapest item on our wall cost $4). Best of all? We’re giving YOU the opportunity to win one of the seven Australian artworks we selected from Etsy for our gallery wall, with a total prize value of $1,073 (including frames!). Read on to find out which Australian Etsy artists made our curated gallery wall, and find out how you can win your favourite artwork. There is a wide variety of amazing original art on Etsy, ranging from paintings, illustrations and screen prints to embroidered art and collage. Original doesn’t necessarily mean expensive, either. We found original works ranging from a few dollars to a few hundred. Here are the original works we chose for our gallery wall. Have you seen Michelle Atzemis‘ work before? We think this Sydney artist is one to watch, and we were excited to see this original acrylic artwork in her Etsy shop. Valued at $350, we used ‘Embracing the Fog’ as our hero piece in our gallery, and extrapolated its colours, themes and textures to guide our other art choices. We love the subtle layers of tones and texture in this piece, and how small details reveal themselves on closer inspection. Flashes of piercing indigo add an extra dynamic to the work’s ethereal aesthetic. We like this work unframed, but it could just as easily be framed. We hung it with 3M velcro hangers, which are ideal for gallery walls that are likely to change over time (and they’re perfect for renters!). After another affordable option? We love Michelle’s set of original acrylic block artworks – just $145. As many of you already know, we’re huge fans of Liz Payne’s embroidered artworks (you can take our tour around Liz’s studio here) and we think this beautifully textural piece, embroidered by hand, is a steal at $120. We love Liz’s bold use of colour and geometric pattern in this abstract work, and it’s perfect for adding a highly textural element to a gallery wall. This kind of work doesn’t need to be framed, either. It has a wire on the back of the canvas, so you can hang it directly on the wall – we used a 3M removable hook. After another affordable option? How about a giclee print of Liz’s embroidered abstract art – just $140. A good gallery wall doesn’t necessarily have to follow any rules, apart from choosing pieces of art that you really love. You could choose a theme, a colour palette, or stick to just one medium. We’ve mixed up our mediums and textures, and based our wall around a loose colour palette. We chose this original illustration by Hollie because we wanted to include an original pencil illustration, and this delicate piece provides a nice contrast to the more dominant works in our collection. The touch of gold also picks up on the golden hues used throughout our selection, including the warmth of the timber in the Flatrock screenprint; the metallic gold in the articulated bird; and the yellow tones in the Evie Barrow screenprint. After another affordable option? How about an original drawing of crab claws – just $80. We chose this minimalist artwork as a foil to the busier abstract pieces on our wall, and we were also drawn to the contrasting use of flat opaque paint on plywood. As our theme was loosely based around a mix of mediums and textures, Flatrock‘s ‘Grey Circle’ was an obvious inclusion. After another affordable option? Go for this punch of grass green on ply screenprint – just $35. An affordable way to start your art collection is to buy prints. Whether they’re screenprints, Gocco or giclee prints, you can choose between limited editions (more valuable) or open editions. If you go for limited editions, try to choose one of the first prints in the run (with number one being the most coveted). Prints are a great way to purchase art from a favourite artist until you’re able to afford an original. The other great thing about prints? The artist will often produce them in various sizes, so you can choose one to suit your wall space. If you have a smallish print, you can still make a big impact on your wall by choosing a large frame – like we did for the Sarah Donnell print – and using a large white matt around it. The whole piece then becomes much more of a statement on the wall. A large frame and mount also gives the print breathing space, which is an important element to consider when creating the perfect gallery wall. We were originally drawn to the original abstract artwork of this print (still fantastic value at $550), but decided to go for the more affordable giclee version for our gallery wall. We love Sarah’s confident brushstrokes combined with a strong composition and masterful use of colour. This is our ‘bold’ choice of art that ties the group in our gallery together. After another affordable option? We’re a fan of this abstract giclee print by Sarah – just $45. We think a great gallery wall also has a strong sense of personality – and in our homes that means playfulness and humour. This print by Melbourne artist Evie Barrow embraces fun and at $35 it ticks all the right boxes for our affordable art gallery. The pinks, blues and yellow also reflect the colour palettes in Michelle’s painting and Susan’s print. To hang ‘Faces And Bananas On Blue’ we tied ribbon to a piece of dowel and attached the dowel to the back of the print with washi tape. This is an inexpensive and cute way to hang a print if a frame is out of your budget. After another affordable option? This original A5 acrylic painting is adorable and great value – just $30. Here’s the fun part – adding a dash of ‘difference’, a pop of personality, and a big injection of interest – by thinking outside of the parameters of what you would traditionally hang on a wall. For our curated gallery, we chose ceramic brooches, a greeting card and a downloadable PDF of an articulated bird to create a sense of fun, as well as add interest by the different shapes and textures. We also love the idea of mixing lo-fi bits and bobs with more serious pieces. The other thing to note? Every single item was super-affordable, so it’s a smart way to round out your gallery wall without breaking the bank. 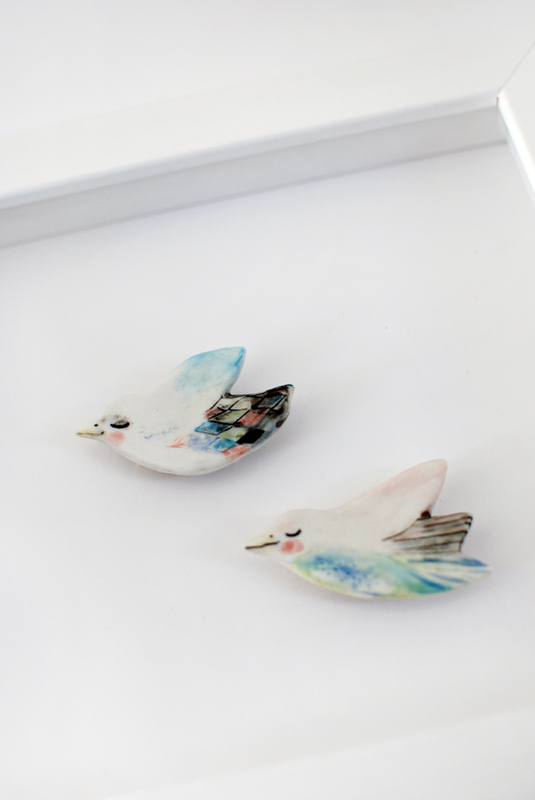 We couldn’t help but fall for these delicate hand-painted porcelain bird brooches by Erin’s Window. We used 3M thick foam double-sided tape to mount two bird brooches on to a matt board, so that they seem to float within the frame. A box frame was used to create a modern spin on a Victorian specimen-style shadow box. We love the result and the colours and themes tie into our hero abstract painting by Michelle. After another affordable option? Get a bird brooch by Erin’s Window like the ones we used – just $29. Spot a greetings card on Etsy you really love? Don’t think twice about using it as part of a larger gallery wall – especially if it adds that pop of colour or personality that’s missing from your group. We chose this light-hearted ‘Hey’ card by Zoe Ingram because of its simplicity of style and pattern – and the pink tones tied in beautifully with our overall colour palette. It was just the right size to balance the other pieces in our gallery wall, too. You can always frame cards if you want to make them into more of a statement, but we like sticking to the lo-fi theme by popping it up using a cute patterned bulldog clip and Blu-Tac. Easy. After another affordable option? We also love this original mixed media collage by Zoe – just $85.66. This articulated spin on the traditional paper doll has the perfect quirk factor to complete our unique gallery wall. We loved the fact that you could download and print out this fantastical creature by talented Sydney artist Emma Kidd for just $4 – making it our cheapest piece of art. After another affordable option? We love this articulated paper kookaburra – another downloadable PDF – just $4. The fine folk at Etsy Australia are giving you the opportunity to win one of seven pieces of art from our curated collection of Etsy affordable art, with a total value of over $1000. Wowsers! Screenprint On Ply, valued at $35. Embroidery on canvas, valued at $120. 2 porcelain bird brooches mounted in a Corban & Blair box frame, valued at $124.72 in total. Giclee print in a Country Road frame, valued at total of $170. Original illustration in a Corban & Blair frame, valued $240 in total. Original acrylic painting, valued at $350. This giveaway closes at midnight AEST on Wednesday 30 September 2015. The winners will be contacted by email and announced on our Facebook page on Friday 2 October, 2015. This giveaway is only open to Australian residents. Disclosure: All links to Etsy are affiliate links, however this does not impact our editorial decisions. All inclusions in We Are Scout are based on their individual merit and ability to make us smile (exploding confetti cannons optional).